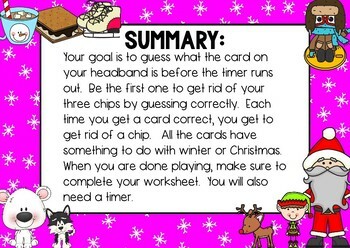 This was my students' favorite free time game so I decided to turn it into a writing center for the winter season! It can be left out for December, January and February. Win win right?! Breathe life and excitement back into your writing centers or take this bad boy out for a test drive the next time you have indoor recess. Even better, play it during your classroom Christmas party! 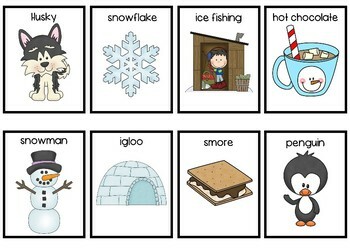 Headbands is a spectacular way to introduce new vocabulary especially to your ELL kiddos. So how does it work? After playing for a designated amount of time set by you, students will practice different writing skills using the cards they guessed correctly during the game. 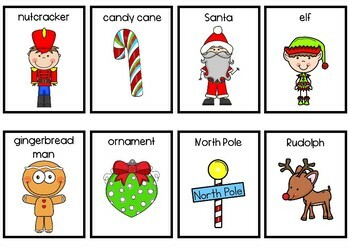 The worksheets included reinforce letter writing, alphabetizing, creating super sentences, producing a story, constructing a setting by describing and drawing it, and making a cardncluded are 48 winter and Christmas themed vocabulary cards, 6 accountability worksheets, and a tracking chart for students. Students will never get bored of playing this which will minimize behavior issues not to mention save you countless hours implementing new centers. View the PREVIEW to get a closer look. :) In case you aren't familiar with the game, the object is to guess the card you have in your headband by asking the other players yes or no questions. TIP: If you don't have the headbands, students can just hold up card to their forehead without peaking. This is a superb inferencing challenge which is a difficult standard to teach because its tricky to teach someone how to think. It's something that takes practice. This also gives students the chance to socialize in a very controlled setting, helping them build quality relationships with their classmates while learning valuable skills like cooperation, listening, and sharing. P.S. 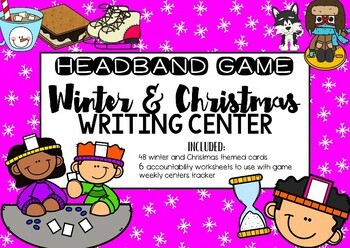 Entire years worth of Holidays and Seasonal Headbands Writing Center is also available in my store if your students enjoyed this edition!